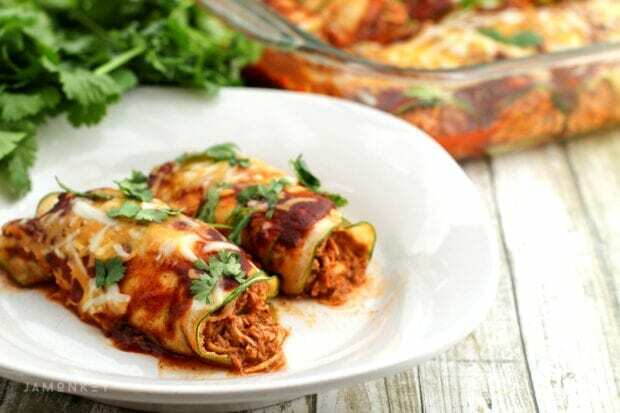 Low Carb Zucchini Chicken Enchiladas are a tasty way to enjoy one of your favorite dishes without the carbs from the tortillas. 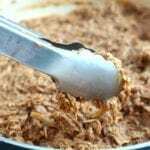 I'm always on the lookout for flavorful low carb recipes. 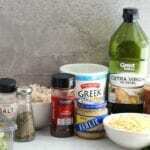 I've been avoiding gluten more and more and substituting with vegetables is a great way to get more fiber. Add minced garlic to a large skillet on medium heat. Gently stir and cook for about 1 minute. 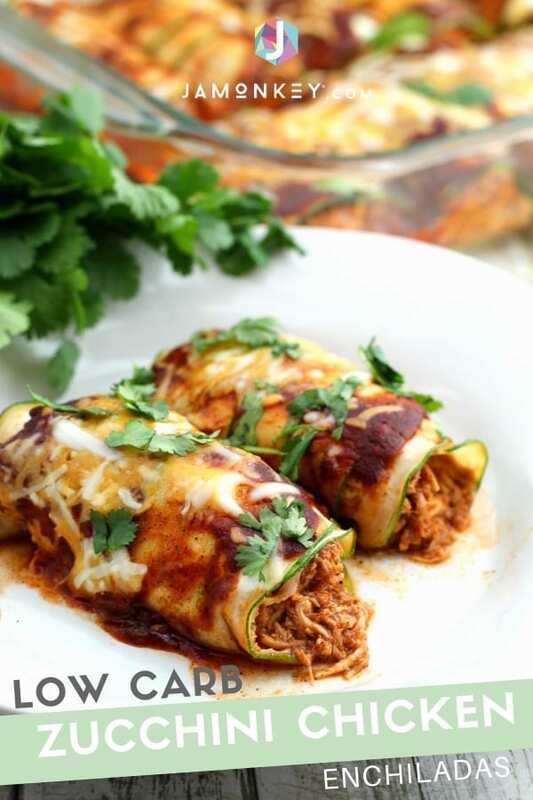 Add shredded chicken, chili powder, cumin, salt, pepper and 1 cup of enchilada sauce. Stir to combine. Allow the chicken, spices and sauce to simmer while preparing next step. 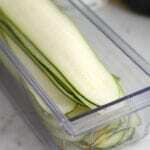 Using a mandoline slicer, thinly slice 3 large skin-on zucchini. You’ll need 48 slices total for this dish. Place 4 slices (overlapping half-way over the next) on a flat surface. 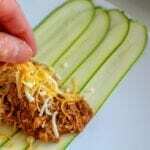 Add 2 tablespoons shredded chicken to the center of the zucchini layers. 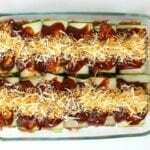 Sprinkle on shredded cheese and roll up both sides. 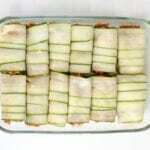 Place the enchilada seam down in a 9x13 casserole dish. 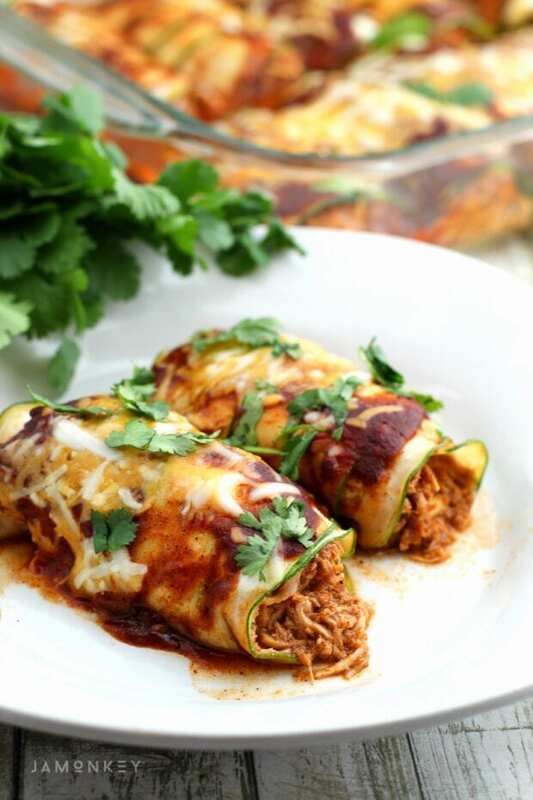 Complete this process until 12 enchiladas are formed and ingredients are used up. Pour remaining enchilada sauce over the enchiladas. Sprinkle remaining shredded cheese on top and place in the over for 20 minutes. 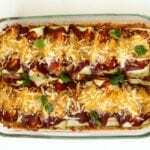 Garnish with optional Greek yogurt and cilantro and serve warm.